A video walkthrough is available. Please click here. Click on the Members tab on the left sidebar, then click Invite member towards the top right corner. 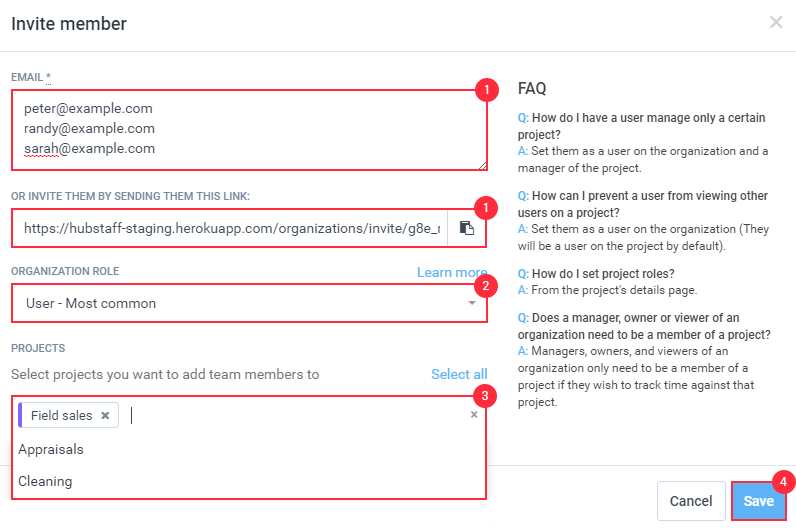 Enter the email address of each team member you would like to invite on a separate line, select their role within the organization and then the projects you want them to be added to. You can also invite them by sending them your unique invite URL which is populated on the invite popup. Your team member will then have to check their email for their invitation and then click the accept invite button which is located inside of the email. Important Note – It’s generally a good idea for you to follow up with your team to make sure that they have received and accepted your invitation. This lessens the chance that they will ignore the email. If your users don’t receive the email, you can resend it via the “Invites” tab. You can also use that page to edit your users’ roles and other data before they accept the invite.